Anyone who has ever done art ro collected art knows the amazing power of this broad medium. From playing an instrument to sculpting a bowl made of clay, art is relaxing and amazing all at once. Here are some of the ways that is seems that art is gaining in popularity. 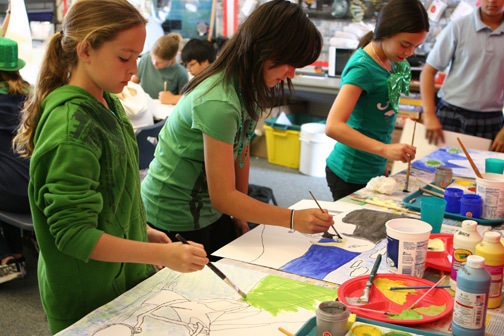 Art in schools is about more than just sketching some still life, or painting a self portrait. Art in schools combines things like science, critical thought, and even chemistry. It’s an important tool when it comes to teaching and is a great for inspiring children to be more creative in their everyday lives. If it were not for art, you wouldn’t have technology, you wouldn’t have clothing, and you wouldn’t have your favorite TV shows or movies. Many towns and cities, small and large, are starting to host annual art festivals. Some of them host small art in the park style shows where local artists can sell their creations to the public. Some of them, however, are large, like ArtPrize in Grand Rapids, where artists from all over the world compete to win monetary prizes and hundreds and thousands of people flock to the city to see the art. People are seeing the importance, and the draw, of art more these days. You can find art galleries popping up in even the smallest of towns. Many of them catering mostly to local artists looking for somewhere to show their work, but also drawing in art buyers and inspiring local creativity through offered classes and art fairs. Art has also been used in therapy for a long time, but more people are finding out what great things it can do for the mind and soul. Art therapy is used in mental therapy, and it can even help in pain therapy. It give people with autism a way to express their feelings without words even. Art makes you feel good. It invokes calm, it makes you think, and it can make you want to create works of art on your own. With all of these great things, it’s no wonder art has been gaining more and more popularity, and people are fighting to keep it in schools, or even bring it back to them.